Add a bottle of wine, Moose Munch® or premium chocolate to your gift. Express two-day shipping is included on this gift. Only standard shipping and processing charges will apply. Please note: To avoid weekend transit, orders placed after 10AM PT / 1 PM ET on Wednesday will ship on Monday of the following week. 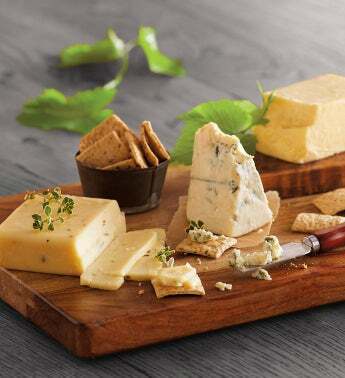 Experience three incredible selections from top artisan cheesemakers in this collection. The Oregon Blue® cheese from the Rogue Creamery has a clean, briny flavor with notes of sweet cream, while award-winning Alpha's Morning Sun™ with Herbes de Provence features aromatic Mediterranean herbs in a unique Alpine-style cheddar. Finally, the Face Rock Extra Aged Cheddar yields smooth, buttery flavor with a creamy texture. Click here for further details and restrictions relating to the purchase of wine, and a list of states to which Harry & David wine can be shipped. You must be 21 years of age or older to order, purchase or receive delivery of wine. A person who is 21 years of age or older must be home to sign for the delivery. Offer void where prohibited by law. Promotions, Celebrations Passport®, coupons and special offers do not apply to products containing wine. Harry & David wine is sold and shipped by Harry and David, LLC, Medford, Oregon. WARNING: Drinking wine and other alcoholic beverages may increase cancer risk, and, during pregnancy, can cause birth defects. For more information go to www.P65Warnings.ca.gov/alcohol. Looking for a Club that’s wholesome, delicious, and as close to nature as it gets? Look no further than the Harry & David® Fruit-Of-The-Month Club® Organic Collection. Each monthly organic fruit delivery will bring a touch of wholesome sweetness to your day. The fruit in this Club is grown, harvested, and packed in accordance with the USDA National Organic Program. Order this Club for yourself and enjoy a monthly organic fruit delivery, or send this fruit Club as a gift to someone who enjoys eating healthy with organic fruit. Each delivery will remind your recipient of your thoughtful gift, whether you’re saying “congratulations,” “thank you,” or celebrating any occasion at all. Each monthly organic fruit delivery will feature a new and wonderful fruit, specially selected to be perfectly in season. We only source fruit from growers who meet strict USDA organic guidelines, so the fruit included in this Club will delight and impress every month. The beautiful organic fruit in this Club includes organic strawberries, organic mangoes, organic bosc pears, and much more. You’ll even receive a box of The Favorite® Royal Riviera® Organic Pears in December. Royal Riviera® Pears are some of our most famous fruits, grown in the Southern Oregon orchards right outside our front doors.